In the NFL playoffs, the best teams usually win, and cover the spread. Identifying the best team is not always easy, but if you can, you can consistently win in the postseason. There are a myriad of stats to look at including straight-up record, core statistics (points, rushing, passing, etc.) and non-core stats (sacks, punting yardage, etc.). Look at yards per play and yards per point. I utilize a system that weights statistics based on their historical predictive properties. In the regular season we can spot situations where a favorite is poised to be upset by a supposedly lowly underdog. In the regular season, even very strong teams sometimes let down their guard. In the playoffs, letdowns rarely happen. This is no surprise. Players and coaches understand that if they lose this game, they go home. There is no next week for losers in the NFL playoffs. So, the stronger teams play up to their true ability. The favorites in the NFL don’t often let up at the end of a game to allow a dog a late cover. In fact, in the playoffs teams run up the score. Even if they are up by two touchdowns, the winning team wants to leave NOTHING to chance and will take the opportunity to score another two if they can. The unwritten rule in the NFL (don’t run up the score) goes out the window in January as opposing coaches and players don’t frown on having another team pile on. They would do it if the roles were reversed! 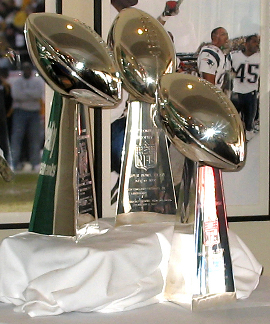 It is widely recognized that home field advantage in the NFL is important. Regular season spreads are routinely adjusted by about 2.5 to 3.5 points in favor of the home team. But in the playoffs, home field advantage cannot be overstated. Home squads don’t have to travel after a long brutal season. The home field energy from the crowd is especially intense in January. Weather plays a big role (just ask a warm weather team like Tampa Bay having to travel to Green Bay or Buffalo in January). And, the better team usually “earned” home field advantage by playing awesome football for 16 weeks. The lines-makers typically cannot adjust the spread enough to account for these factors. Over the past eight seasons, home teams have covered the spread nearly 64% of the time! Home dogs are very rare (we have seen only 26 from 1982 through 2011) but if you find one, consider it as a possible strong play as they are 16-9-1 against the spread in those games. In the playoffs, we have reliable data from 16 games worth of stats to evaluate. As stated earlier, the best teams step up in January and there are fewer situational letdowns and surprises. The teams with the advantage in key statistical areas usually win and cover. Knowing which stats to emphasize can lead to very successful spread predictions. Usually picking the better team will lead to a win and cover in the playoffs. The trick is determining which is the better team - it is often hidden. Keep these items in mind when handicapping the NFL playoffs. My postseason picks utilize systems built around these variables. Now, read about my approach to SuperBowl Picks. Click here to see my philosophy for the NFL regular season.